At nine o’clock sharp a swoosh of sheets being pulled off tables sounded across the ancient wooden town. Then there was a communal rustling as bottoms settled into chairs. Finally a deafening click-clacking echoed through the stone streets. It was mahjong time in Shangli. Dinner was finished and the entire town was at it. They would stay at it until the early hours. Every night. My nightmares echoed with the sound of mahjong tiles being rattled around by electric tables. Accompanied by a concentrated sucking on cigarettes, clinking of tea cups or whiskey glasses and much muttering. We’d finally fled the rotting concrete vistas of Chengdu, relieved to find that there was an end to that seemingly endless city. Despite the food, it had all got too much. 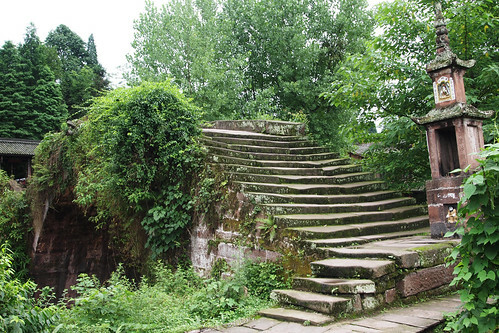 We were on a quest for fresh air, some greenery and a glimpse of rural China. 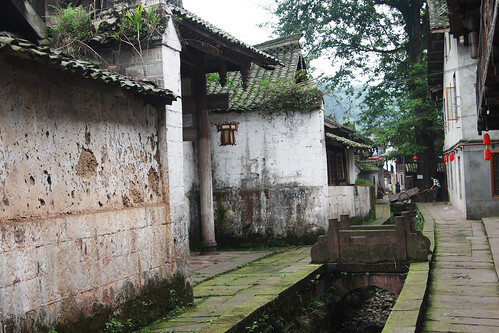 And while few could claim that the historic – and nostalgic – village of Shangli was an authentic vision of the contemporary Chinese countryside, it was rather lovely. Until 9pm and the mahjong started. 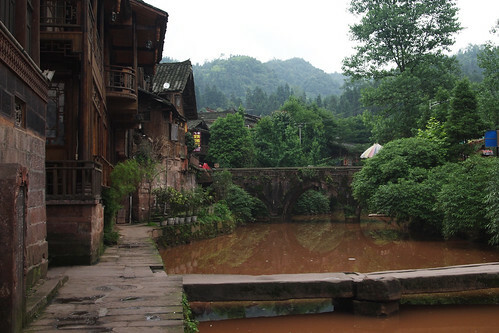 Shangli is a restored, some might say overly so, Sichuan trading town that sits astride the old tea road to Tibet. Tea would flow in one direction, horses in the other. And the five big families here got rich on the proceeds. The town itself is made of wood and stone, with five large walled compounds linked by narrow cobbled alleyways dressed in mossey slabs and lined with wiiden buildings. It is well over a thousand years old with carvings around the White Horse Spring dating back to the seventh century. More recently the Red Army stopped here during the Long March and left soldiers stationed in the town. You can still see many of their graffitied slogans carved into walls and on stones. 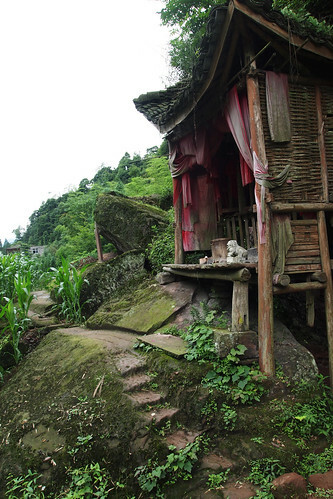 The hills are covered in bamboo and shrubs, the air is laden with moisture and everything smells rich and damp. Mists hang heavy in the morning and if the river weren’t running red from some bank-reinforcing work being done upstream, the town could’ve come straight from an antique ink and wash painting. Despite speaking no English, the people, although obviously not used to unchaperoned Western tourists, were very friendly. After a little curious staring back and forth as we wondered how to find (or even recognise) a place to stay, a young woman stepped forward and led us across the ancient stone bridge and into town. We weren’t sure whether we had got a guide or a hotelier as she led us deep into the town, through a gateway and toward a temple. At the last minute we turned into a wooden building and were shown a bedroom. This was like staying in the Tower or London or sleeping in the Globe Theatre. Sauntering around, particularly in the early morning or around dusk when the tourists and coach groups had left, was lovely. The tourist tat was put away, food was thrown into woks and beers were cracked open. And we had the quiet streets almost entirely to ourselves. The next morning we followed the old tea road along the red river and out of Shangli. It was a narrow stone path that had been trod by countless feet. It took us out past rich red-earth fields of corn and vegetables and out into the bamboo forests. 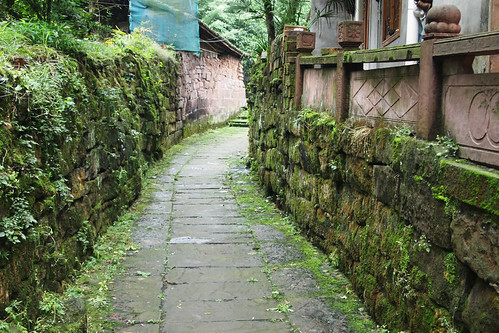 It soon narrowed to a footpath that led through the greenery, past shrines clinging to rocks and farmhouses in various stages of ruin or restoration. Butterflies the size of saucers fluttered in and out of the leaves, gleaming iridescent blue or sunburst yellow. Great metallic beetles crawled methodically across the muddy path and spiders spun webs, gleaming tapestries of droplets in the humid air. The nature was as varied and unafraid as it was unexpected. When you think of China, too often you think of still scenes from water colours, or great cities. Teeming multitudes of people and rice paddies. But this was another side to the country, and one we would encounter throughout the trip. Small lizards scurried and darted along wooden walls chasing insects. And at night, in the early hours after the mahjong players had retired, something gamboled merrily across the roof just over our room. Claws skittered on tile as it chased down scampering prey. We never did find out what it was. Despite having no language in common with the locals, we got along just fine with plenty of gesturing and pointing. People were patient with us and obviously happy to help where they could. And not being able to ask for particular dishes meant that we got whatever they were making for dinner. 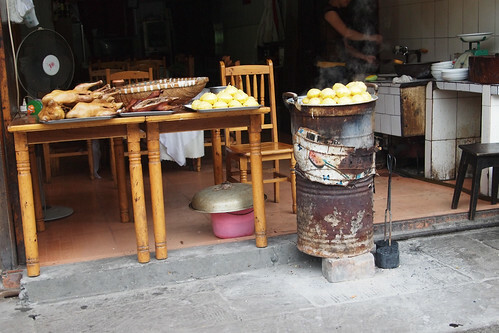 And goodness me, even outside of Chengdu, the food did not disappoint. From the staples of Mapo Tofu and the best Gong Bao chicken I’ve ever eaten to more esoteric dishes involving snakes or eels (I never worked out which), or pork fat and noodles, the food was all excellent. Cooks seemed to be able to whistle up a veritable feast at the drop of a hat, and ten minutes after sitting down and being served the ubiquitous local tea, a parade of dishes would arrive. Firey and numbing, full of flavour and very fresh indeed. And as night fell and the mahjong tables were uncovered, we would – to the unceasing fascination of the locals – play scrabble. We’d invariably attract a curious audience whenever we pulled the travel scrabble set out. From roadsides to restaurants people couldn’t get enough. They’d watch, comment, shake their heads and point things out to one another. Finally, after a few beers we would retire to the hotel and slowly doze off, trying to block out the echoing click-clacking of tiles as yet another game of mahjong started. This looks like a trip of a lifetime from the photographs – and sounds even better. Evocative writing, I can almost hear those tiles being manipulated amongst the muttering and clinking. It’d be interesting to know what they are making of the travel scrabble! Excellent! I love the Scrabble anecdote – you’ve probably gone down in village mythology as the couple who played “English Mahjong”! God it looks beautiful, lovely lovely post! @Mr Noodles – that may be true, they really were fascinated, and not shy in showing it either. @Paul – thanks Paul! The thing about Sichuan which I never realised is that it’s perfectly possible to make go there for a two week holiday , flying direct to Chengdu… food for thought. Such excellent writing, so pictorial. Unless you already do know how to play mahjong. that looks like one epic trip. i love the way you write btw, I wish I could be there! Great post. It just gives me more excuses now to go back to Sichuan. As if I really ever needed one. @Shuhan – it was an amazing three month odyssey across three continents – much more writing on it to come. And thanks! 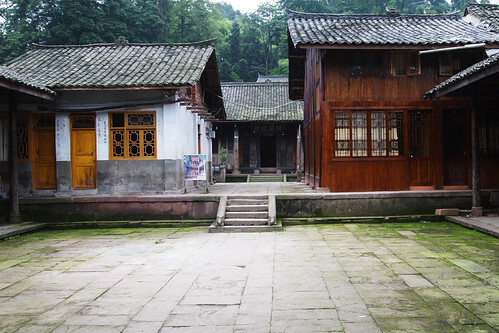 Ok third time lucky….evocative write up on your travels to Shangli, makes me want to visit. It all looks so picturesque and charming, especially your living quarters. Did you try and learn mahjong? It’s definitely on my to do list. It was an wonderful old place, despite the all night tile racket . As with the rest of China, the food was ace and having no common language was not an issue. Everyone was so friendly. It was beautiful too.